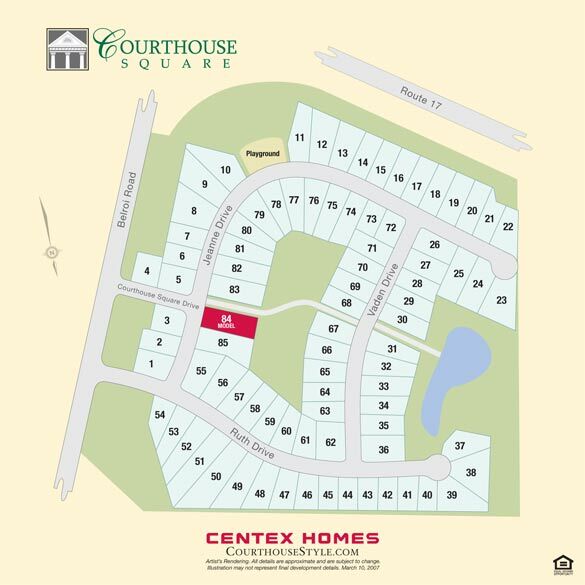 Courthouse Square (CSQ) is a Centex development first established in 2007. Consisting of 85 homes, CSQ is located off of Belroi Road near the intersection of US-17 and Belroi Road–less than two miles from historic Gloucester Courthouse. With many local amenities (several local and chain restaurants, home improvement stores, grocery stores, hotels and a Wal-Mart) just a brief drive away, CSQ is close to everything, but far enough away to avoid noise and congestion. Many of CSQ’s residents serve, or have served, in the United States armed forces. All branches of the military have bases located within an hour’s drive of CSQ. We are proud of all our military neighbors and deeply appreciate their service to our country. CSQ families also include many police officers, teachers, and medical service providers. Membership in the Courthouse Square (CSQ) Homeowner’s Association (HOA) is a stipulation of home purchase in CSQ. Membership benefits include access to all public CSQ amenities, including a playground and nature trail, as well as trash and recycling services. We are a registered not-for-profit organization and governed by several official county and state documents. The CSQ HOA is managed by Property Management Associates, LLC of Virginia Beach. ARC guidelines and applications are available on the CSQ Documents page. The ARC meets as needed. Please check the Calendar page for more information.